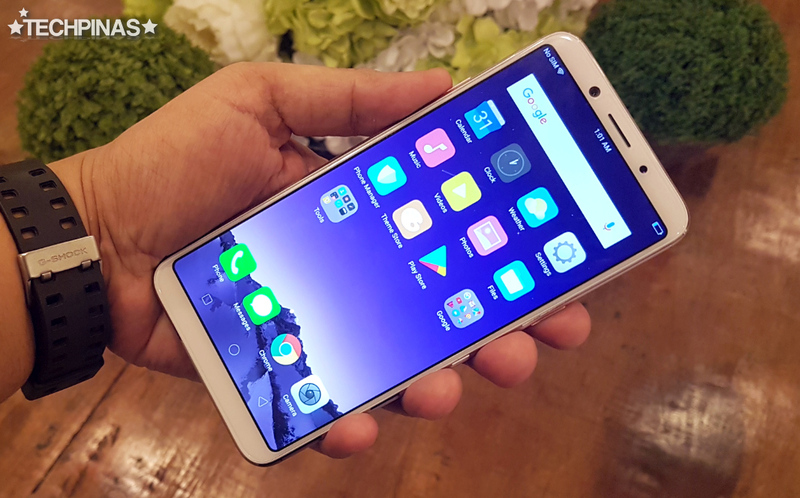 Earlier this evening - October 26, 2017 - OPPO F5 was officially launched in the Philippines via an exclusive event for bloggers, members of the media, and OPPO nationwide dealers held at The Grand Ballroom of The City of Dreams in Paranaque City. For those who've been eagerly waiting for this update: The selfie-centric handset dons an official price tag of Php 15,990 and will be up for pre-order starting today until November 3, 2017. OPPO F5 will hit store shelves in malls nationwide starting on November 4, 2017 and will likewise be available as a bundled handset with Smart Postpaid Plan 599. 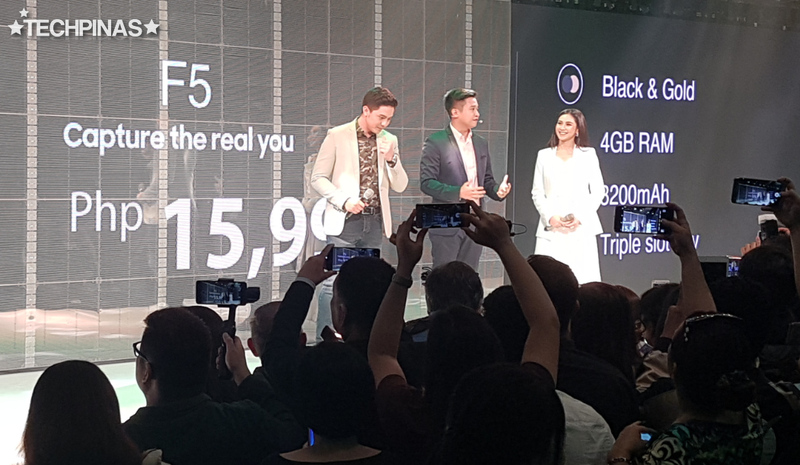 Mr. Stephen Cheng - OPPO PH Brand Manager - was joined on stage by OPPO Celebrity Endorsers, Sarah Geronimo and Alden Richards for the unveiling of the smartphone's suggested retail price here in the Philippines. 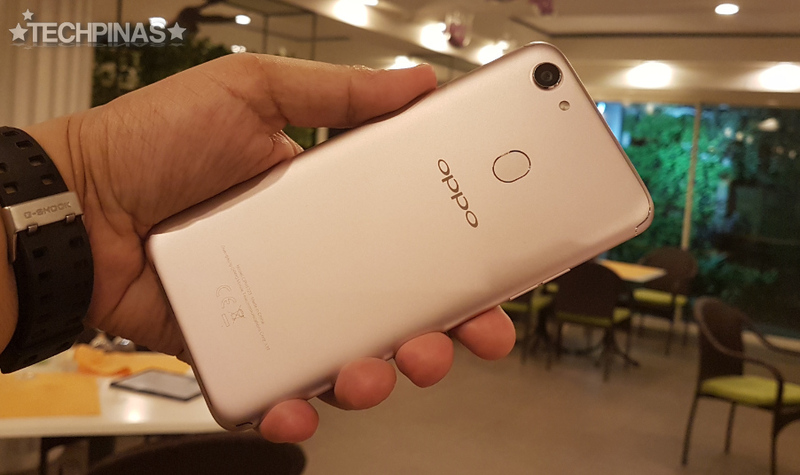 Clad in anodized aluminum and available in two colors - Gold and Black, OPPO F5 is equipped with a 6-inch Full HD+ IPS Full Screen, 20 MegaPixel f/2.0 front cam with AI Beautification Technology, 16 MegaPixel f/1.8 PDAF rear camera with LED flash, Dual SIM Dual Standby capability, 4G LTE+ support, and a non-removable 3,200 mAh Li-Ion battery pack. Under the hood, its Color OS 3.2 skinned Android 7.1 Nougat OS with an 2.5 GHz Octa Core Mediatek MT6763T Helio P23 processor, has 4GB of RAM, and comes with 32GB of onboard storage that's easily expandable via the dedicated microSD card slot. For improved privacy and security, OPPO F5 has a Fingerprint Scanner at the back as well as Facial Unlock feature, which used to be only available on far more expensive smartphone by other brands. Last Thursday - October 19, 2017, I got the chance to play with the handset ahead of Pinoy consumers through an intimate get-together organized by our friends at OPPO Philippines in Makati City where they gave bloggers and members of the media a hands-on preview of what their newest device has to offer. Aside from its beautiful design, thin and light build (7.5mm, 153 grams), and massive 6.inch Full HD+ 2,160 x 1,080 pixels IPS display, OPPO F5 has one great feature that immediately captured my fancy. 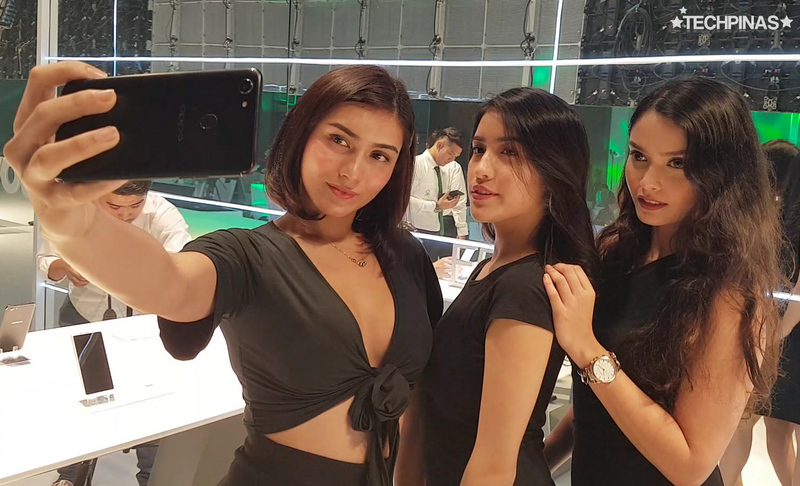 You see, this model is the first one from OPPO to be powered by their latest AI Beautification Technology, a unique software that's supposedly sophisticated enough to "capture the real you". 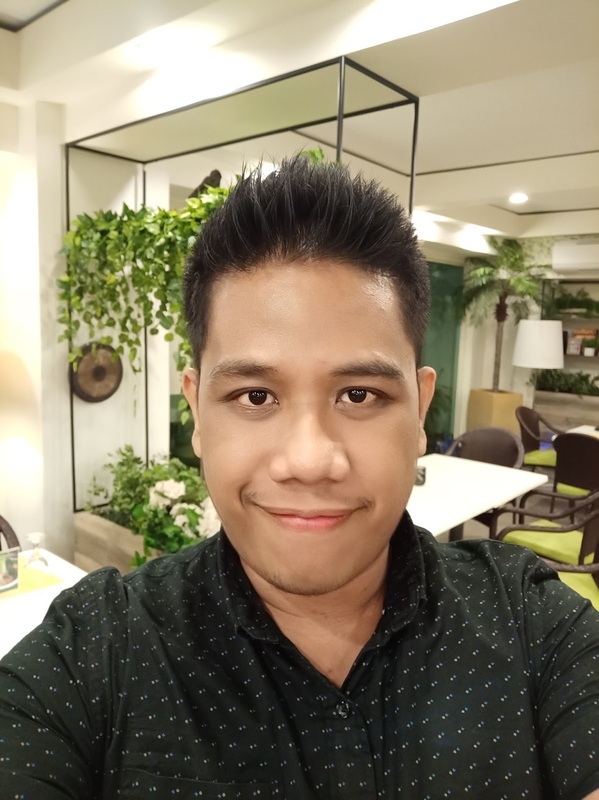 To demonstrate the notable prowess of this innovation, I'd like to share two selfies taken using the powerful front-facing camera of OPPO F5. I snapped this raw photo of my face using the standard photo with no beauty filters or post-processing. As you can see, the photo above shows all of my facial features and imperfections - which are only some of the things that make me unique as an individual - including the pimples on my forehead, my broad nose, my dark eyebags, and the uneven skintone on my puffy cheeks. 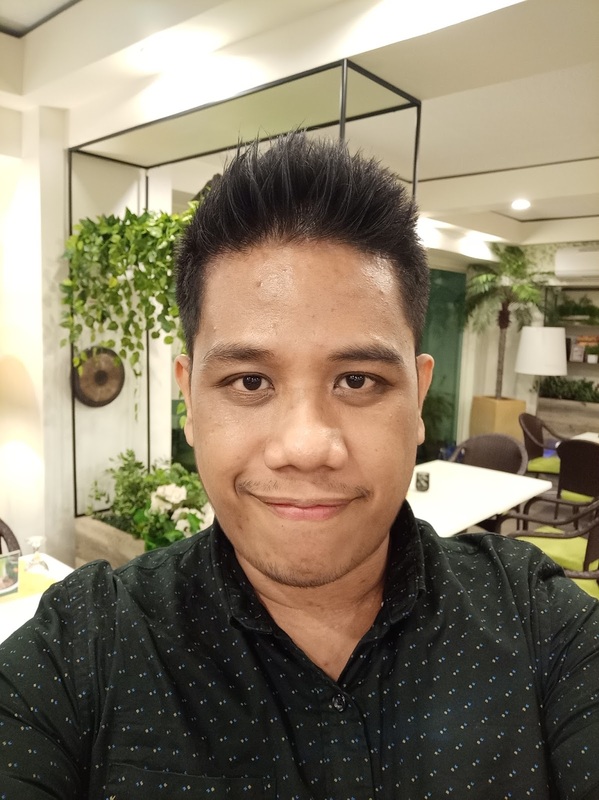 Now, let me show you another selfie that I took using the OPPO F5 but this time, with Beauty Mode on. Note that this shot benefits from the company's AI Beautification Technology. As you may have noticed in this image, OPPO F5's new Beauty Mode tries to retain the unique facial details of the user to deliver selfies by employing a more intelligent skin imperfection clearing. This becomes more apparent when you look at my hairline, my eyebrows, the size of my nose, my cheeks and eyes, as well as my eyebags. The details are still there. I wouldn't say this OPPO selfie innovation more subtle or less aggressive compared to the beautification software of other brands but I think it's certainly smarter in the sense that it doesn't considerably alter how you actually look in person. If you ask me, this is a definite step forward in Selfie Imaging Technology; One that other companies might want to look into. For now, though, it's clear that OPPO is the only company that offers this next-level selfie expertise. 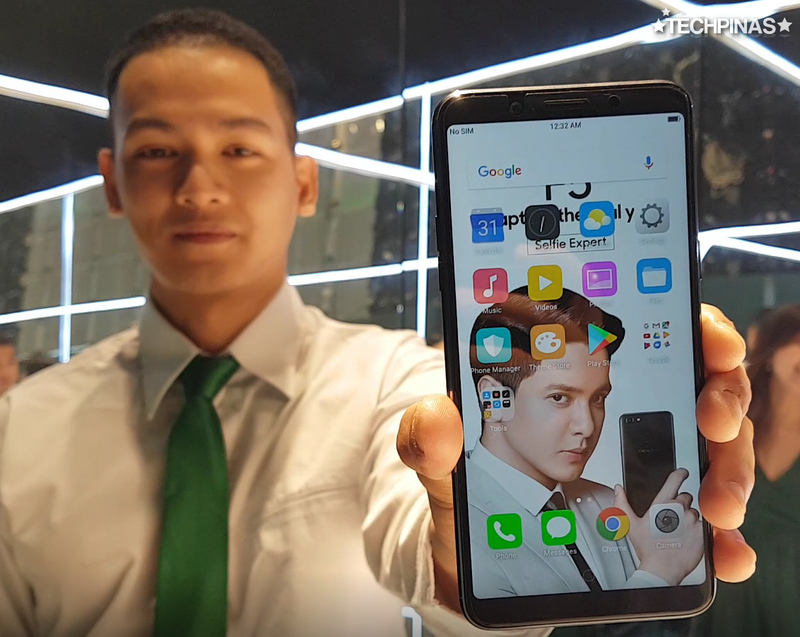 According to our friends from OPPO Philippines, the OPPO F5 delivers "selfies that capture the real you" by having an improved facial recognition technology that automatically scans 200-points on the user's face and instantly identifies his or her gender, age, and even race. Then, AI Beautification utilizes these information to come up with selfies that capture the essence and individuality of the user. Do you want to look good in your selfies but you also want to make sure that your selfies still look like you and not another person altogether? OPPO F5 could be the right cameraphone for you.